430 Bright Annealed Stainless Steel Sheets will be added to your quote! 430 is in the "Ferritic" group of stainless steels, containing more chromium, no nickel, and carbon from .6% to 35%. It is magnetic and does not respond to heat-treatment. SS 430 has good corrosion resistance and is highly resistant to atmospheric oxidation and strong oxidizing solutions. It can be readily drawn and formed, and it is weldable by common techniques. 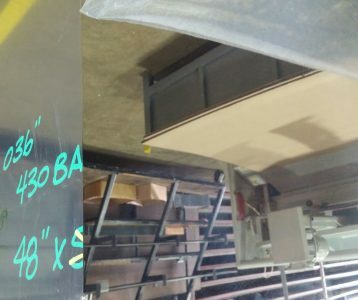 The SS 430 Bright Annealed sheets have a mirror-like appearance, and this material is magnetic, so please be sure to understand your application before ordering. Stocked in full sheets, generally 48 x 120; cut pieces available. AED stocks stainless sheet in a variety of thicknesses, Meets ASTM A240 and others. 430 Bright Annealed Stainless Steel Sheets will be added to Cart!